Bangkok, Thailand -- Prime minister Samak Sundaravej began his morning by making merit on Maka Bucha Day, the day the Lord Buddha gave his first sermon to 1,250 of his disciples who gathered before him without any prior arrangement. 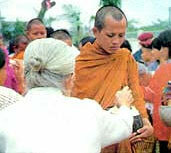 Maka Bucha takes place on a full moon on the third lunar month – usually in late February or early March. This morning Prime Minister Samak led his cabinet ministers and government officials to take part in a merit-making ceremony at the statue of King Rama V.
The premier gave alms to 184 Buddhist monks to mark the Buddhist religious holiday. He will then take part in a procession later this evening to complete three circles around Phra Sri Rattana Satsadaram temple, known by Thais as the "wien thien" procession.